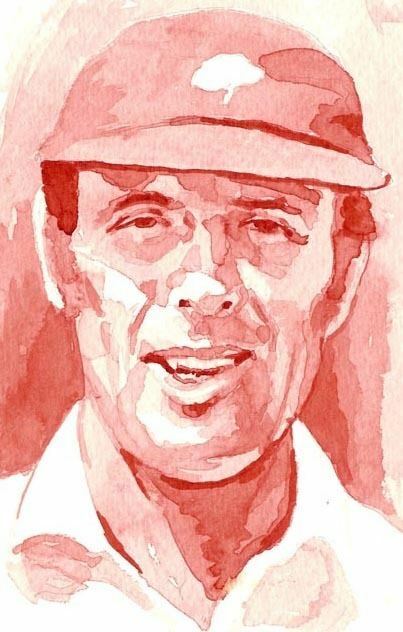 Geoffrey Boycott OBE (born 21 October 1940) is a former Yorkshire and England cricketer. In a prolific and sometimes controversial playing career from 1962 to 1986, Boycott established himself as one of Englands most successful opening batsmen and since retiring as a player, he has found further success as a cricket commentator. Boycott made his international debut in a 1964 Test match against Australia. He was noted for his ability to occupy the crease and became a key feature of Englands Test batting line up for many years, although he was less successful in his limited One Day International (ODI) appearances. He accumulated large scores – he is the equal fifth highest accumulator of first-class centuries in history, eighth in career runs and the first English player to average over 100 in a season (1971 and 1979) – but often encountered friction with his team mates. Journalist Ian Wooldridge commented that "Boycott, in short, walks alone", while cricket writer John Arlott wrote that Boycott had a "lonely" career. Others, however, have stated that the extent of his introverted nature has been exaggerated, and that while he was "obsessed with success" he was not a selfish player. After 108 Test match appearances for England, Boycott ended his international career in 1982 as the leading Test run scorer with over 8,000 Test match runs, earning an OBE for services to cricket. When dropped from the Yorkshire team in 1986 he was the leading run scorer in first-class cricket. In 1965 while still a young player he had been named as one of five Cricketers of the Year by , the cricket almanack, and he was inducted into the International Cricket Councils Hall of Fame in 2009. After his playing career ended, Boycott became an often outspoken and controversial cricket commentator on both radio and television. In 1998, he was convicted of assaulting his former girlfriend Margaret Moore; he was given a suspended sentence and fined. In 2002, after being diagnosed with throat cancer, he underwent successful radiation treatment, and went into remission. He revived his commentating career in 2003, and continues to attract both criticism and praise. He is currently a member of BBC Radio 4 Longwaves commentary team, and was President of Yorkshire County Cricket Club between March 2012 and March 2014, succeeded by Dickie Bird. Boycott was born in the mining village of Fitzwilliam, near Wakefield and Pontefract in the West Riding of Yorkshire. He was the eldest of three sons of Jane (née Speight) and Thomas Wilfred Boycott, a colliery worker from Shropshire. When Boycott was eight years old, he was impaled through his chest by the handle of a mangle after falling off an iron railing near his home. Boycott nearly died, and in the efforts to save his life, his spleen was removed. In March 1950, Boycotts father had a serious accident while working as a coalminer. His spine was severely damaged after he was hit by empty coal carts; Thomas Boycott never fully recovered, and died in 1967. Boycott attended Fitzwilliam Primary School. There he won a Len Hutton batting award for scoring 45 runs and capturing six wickets for 10 runs in a school match. At age 10, he joined Ackworth Cricket Club, demonstrating "outstanding ability." At the age of 11 he failed the examinations that would have taken him to grammar school, and instead went to the local Kinsley Secondary Modern School. A year later, however, he passed his late-entry exams, and transferred to Hemsworth Grammar School. His cricket prowess was such that he captained the schools Cricket First XI at the age of 15. During winters he attended an indoor cricket school, where he was coached by former county professional Johnny Lawrence. While studying for his O-levels he began to have difficulties reading the blackboard and was initially devastated when told he would need glasses. At first, he played poorly at school, encumbered by the fragile spectacles, before a more robust pair was fashioned for him at the behest of his uncle, similar to those glasses worn by cricketer Roy Marshall. His uncle would go on to be a strong influence on Boycotts early cricketing game whilst playing for Brierley Juniors Football Club. In 1958, Boycott left school with seven O-level passes and the schools Individual Cricket Cup. That summer he played for the Leeds United under-18 football team alongside Billy Bremner and attracted the attention of Leeds United scouts. During the winter he continued to play nets of uncle Lawrence. Boycott told the BBC in 1965 that he chose to leave school at 17 because he no longer wished to be a financial strain on his parents, and because he wanted to pursue his cricketing career. He worked as a clerk in the Ministry of Pensions and National Insurance in Barnsley from 1958 to 1963, at the same time playing for a number of cricket clubs. Boycott captained the South Elmsall district team, and achieved a batting average of 70. He also played for the Yorkshire Federations Under-18 team, and for Barnsley, where he was noticed by Clifford Hesketh, a member of Yorkshires County Cricket team committee. Boycott began playing for his home county in 1962 after topping the averages for Leeds, Yorkshire Colts and Yorkshire Second XI. In 414 matches for Yorkshire he scored 32,570 runs at an average of 57.85, with a highest score of 260 not out against Essex, and 103 centuries in all. He scored another 8,699 runs in List A cricket, averaging 40.08. Boycott twice averaged over 100 in an English first-class season: 100.12 in 1971, and 102.53 in 1979. He is one of only two players to have achieved this twice, Mark Ramprakash being the other. Boycott was appointed captain of Yorkshire in 1971, but was sacked in 1978 after failing to win a trophy while in charge. He was then dismissed as a player, but reinstated after a members revolt. During his career Boycott frequently clashed with other strong personalities at the club, including Fred Trueman, Brian Close and Ray Illingworth, but remained popular with the Yorkshire crowds. Boycott captained Yorkshire for eight seasons from 1971 to 1978, having been appointed following the sacking of Brian Close in 1970. Despite well publicised conflict between the two players, Boycott recorded in 1987 that he regretted Closes removal from the club, and wrote him a letter in admiration for his contributions to Yorkshire. To captain Yorkshire had been one of Boycotts aims since he started county cricket in 1962. Yorkshires scorer Ted Lester commented later that Boycott "never got the support he deserved from the committee. After the captaincy was decided on a casting vote, the half that didnt want him never wanted him." Some members of the committee wanted to remove him almost immediately. He also caused strife between his fellow players, including a reciprocated dislike for Richard Hutton, with many players leaving the club citing personal differences with Boycott as the reason for their departure. After his first season as captain he spent the winter of 1971 playing in South Africa for Northern Transvaal. He played only one match, however, scoring 107 and 41. Over Boycotts 18-year career he scored 8,114 runs in 108 Test matches for England. He was the first England cricketer to pass 8,000 Test runs and, as of 2012, is fourth on Englands all-time run scoring list (behind Graham Gooch, Alec Stewart and David Gower). His average of 47.72 runs over 193 innings is the highest completed career average among England players since 1970. His Test career included 22 centuries (an England record held jointly with Wally Hammond, Colin Cowdrey, Kevin Pietersen, and current England captain Alastair Cook until December 2012 when Cook made his 23rd England century). England did not lose a Test match in which he scored a century and only 20 of his 108 Tests ended in defeat. John Arlott wrote in 1979 that "any expectation of an English win, except in freak bowling conditions, is based on a major innings from Boycott." England hosted New Zealand and South Africa in 1965. Against New Zealand, Boycott scored 23 and 44 not out in the first Test at Edgbaston and 76 in the second at Lords, but missed the third Test owing to injury. He returned against South Africa at Lords, but after scores of 31 and a slow 28 in 105 minutes, the press began to speculate that his may lose his place in the team. In the second Test, Boycott made a duck in the first innings and later took 140 minutes to score 16 runs when England needed to score quickly; Wisden described the latter innings as a "dreadful effort when courage was needed". Subsequently, Boycott was dropped and replaced by Eric Russell. Boycott returned to the team at the end of the season for the tour to Australia. In the 1965-66 Ashes series, illness dogged his performance initially. He then hit a form of "brighter cricket" during the First and Second Tests. Uncharacteristically, he hit a four from his very first delivery at Perth, and put on 98 in 16 overs with Bob Barber in the Second Test. In the Third Test, Boycott and Barber shared an opening partnership of 234 in four hours; Boycott hit 84, his highest score of the series. But in the Fifth Test he monopolised the strike, ran out Bob Barber and took 75 minutes to make 17 runs. His form deserted him again when the MCC went on to tour New Zealand. In 1966, England faced the West Indies. Boycott was omitted from the first Test, but shared a partnership of 115 with Tom Graveney. However, he struggled during the series, and managed an average of 26.57. It was a disappointing year for Boycott both for England and Yorkshire, and his average for the former fell to 36.60. Furthermore, he had only passed 50 twice in his last 12 first-class innings. The following summer, he rediscovered his form. On 8 and 9 June 1967, he made his highest Test score of 246 not out against India on his home ground of Headingley. Batting for 573 minutes, Boycott struck thirty fours and a six at a strike rate of 44.32. He began his innings slowly, taking six hours over his first 106 runs; he scored 17 in the first hour and 8 in the second. This particularly frustrated the England selectors as the pitch was excellent for batting, and the Indian attack was weakened by injury. Their frustration was exacerbated when Boycott added 140 runs in four hours on the second day. Ian Wooldridge wrote in the Daily Mail that Boycott "could not be excused by his nearest and dearest relations." He did not bat in the second innings and England won by six wickets. Following this public support, Boycott resumed writing for the and commentating on Channel Four for the Cheltenham and Gloucester Championship Final and the following summers cricket. Radio Five Live then hired Boycott in early 2004. His fellow commentators state that his illness has altered his voice and led to a more pleasant personality, but that he is still prone to unpleasant behaviour. Channel Four producer Gary Francis stated "I think Geoff is a lot more mellow now. He still has his moments, like when the taxi does not arrive and he is not happy, as he makes extremely clear. But overall hes great fun to work with." In September 2004, Boycott wrote for the a posthumous tribute to lifelong friend Brian Clough. Boycotts playing style revolved around intense concentration, solid defence and attention to detail, while avoiding heavy hitting or slogging. He was described in The Complete Encyclopaedia of Cricket as "one of the greatest opening batsman that the game has known. He dedicated his life to the art of batting, practising assiduously and eschewing any shot that might even hint at threatening the loss of his wicket." Through his Test career, he scored 15.4% of Englands runs, and England won 32.41% of the Tests in which Boycott played. This compares with Englands 34.76% victory rate over all Test cricket history. Richard Hutton, Yorkshire and England batsman and son of Len Hutton described Boycott as a "one-pace player", suggesting that he was unable to alter his playing pace as the match circumstances dictated. Nevertheless, Boycott maintained an "impeccable" defensive technique, and possessed a temperament ideally suited for five-day Test matches. Arlott wrote that "his technique is based on a defence organised as near flawlessness as may be." Boycott himself remarked, in 1981, that: "Given the choice between Raquel Welch and a hundred at Lords, Id take the hundred every time." His careful batting is reflected in his 22 centuries for England, of which only two had a strike rate of over 51.00. Former England bowler Frank Tyson wrote in 1987, in The Test Within, that "the greatness of Boycott the batsman and the gaffes of Boycott the man had common roots in an unceasing quest after perfection." While this style facilitated his solid defensive play, it inhibited him as a stroke player and made him susceptible to hand and arm injuries. Such injuries would be common throughout his career. One such injury almost required the tip of a broken finger to be amputated. He was occasionally vulnerable to left-arm bowlers, either due to his inability to adjust his line of stroke or because during his career there were few fast left-hand bowlers for him to practice against in the nets. Boycott himself disputes this. In spite of that, he was never vulnerable to any one particular bowler. Pace bowler Dennis Lillee was the most successful against him in Test matches, with seven dismissals. Gary Sobers also dismissed him seven times, but Lillee did so in fewer matches. Peter Lever, a Test colleague, discussed with Boycott his vulnerability when playing the hook stroke, which was to get him out on more than one occasion. Overall in Test cricket, 54% of Boycotts dismissals were by being caught, with lbw and bowled taking 14% and 16% respectively.